Welcome To ColleenRichman.com: My Boys Are Loving Their Dr. Elseys! My Boys Are Loving Their Dr. Elseys! My male cats are both finicky eaters. My husband and I like to joke, since they are both rescues, they sure have expensive taste! They refuse to eat any of the "less than desirable" cat foods that are out there, AKA the inexpensive food that really isn't good for them anyway. I like to feed my cats the best, there was a time I ran out of food and forget to get another bag so I made a quick dash to the store to buy a small bag of the "inexpensive" brand cat food just so they would have food to hold them over until I got their regular food. They REFUSED to eat it! They know what's good for them, what tastes better and most importantly they know what they won't eat. Recently Chewy.com sent us some Dr. Elsey's Clean Protein Salmon Formula, that's a grain free dry cat food, to try out. Offering high quality ingredients, you can be sure your kitties are eating healthy food. Contains 90% protein animal based, which means your furry friends are eating quality meat and not by products. It's grain and gluten free so if your cats have allergies this will also work. 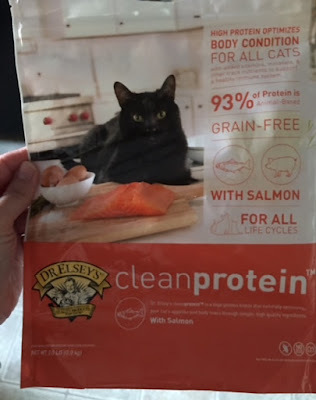 When I opened it, it didn't have the normal cat food smell. It literally smelled like fish! Not that fish is a particularly pleasant smell, (I don't even like to smell it at a restaurant when my hubby gets it) but I knew it was the real deal! I felt comfortable giving it to them, and they were very comfortable eating it. As you can see from the mess they are making here, the food is small, which I like because my black cat is older and doesn't have the best teeth. To me, this is a perfect food all around and they both seemed to enjoy it. If you're looking for a healthier alternative for cat food, I'd recommend this!